Use of non-sterile equipment for piercing. Not observing sterile techniques such as touching the pierced site without wearing gloves. Wearing of very tight clothes and jewelries, which could restrict the flow of blood, making you vulnerable to infection. Poor hygiene, making you susceptible to infection. Used of substandard piercing equipment such as fancy jewelry. Harbored bacteria in the hospital or so-called nosocomial infection. Image 1 : An infected cartilage piercing on the ear region characterized by redness and swelling. 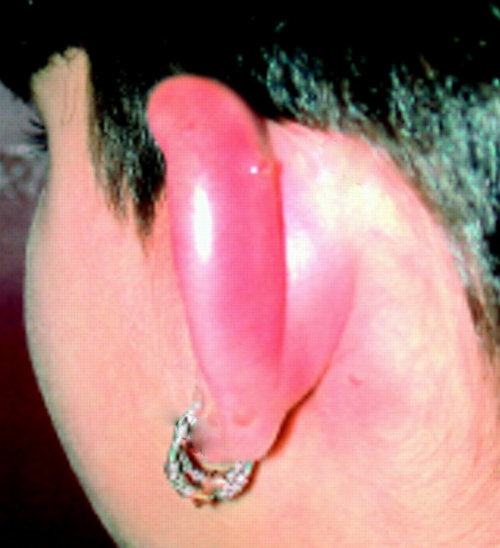 Figure 2 : A severe infection of the cartilage piercing. 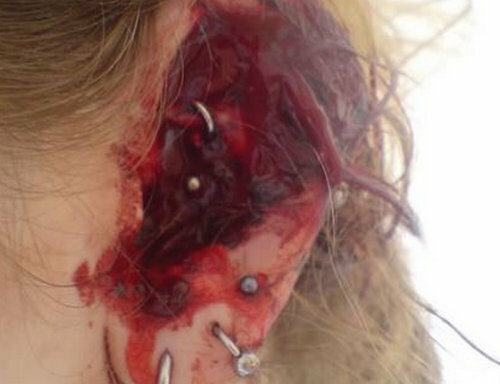 There are multiple piercings and the infection is severe. There is a noticeable redness and swelling on the affected part. The infected part and its surrounding tissues are tender to touch. The patient complains of severe pain. There could be some discharges, which are yellowish to greenish in color. Antibiotics – Antibiotics are very good at treating infection, especially cartilage piercing infection. A medical practitioner will thoroughly assess the infected part to verify if the infection is caused by a bacteria. However, ordinary antibiotics may not work due to restricted blood supply in the cartilage area. A stronger antibiotics should be used. Warm compress – To increase the blood supply in the cartilage, a warm compress should be applied. It would help a lot if you are going to prepare a mixture of warm water and sea salt. Basically, you will have a saline solution. To further boost the circulation of blood to the infected part, you have to eat nutritious foods and avoid bad vices such as smoking and drinking alcohol. Is it necessary to remove the jewelry if the piercing gets infected? Your instinct will tell you to remove the jewelry once you notice the signs of infection. Well, this is a wrong move. The jewelry can actually help in the draining process and so you shouldn’t remove it. If you remove the jewelry, it could close up the pierced channel and an abscess will form. The cartilage does not have that much supply of blood, which requires it more time to heal. To somehow hasten the healing process, you should observe proper hygiene and proper care. Keep the piercing site clean at all times. How to prevent cartilage piercing infection? Be very gentle with your cartilage piercing. The piercing site is an open wound and it definitely takes time to heal. Hence, you have to make sure you keep it clean to prevent infection. Clean the piercing site with a saline solution or an antibacterial soap. If you have a sensitive skin, then you should use gentle soap and wash the piercing site two times a day. Rinse and pat dry using a disposable paper product. Do not use cloth as it can harbour harmful microorganisms. As much as possible, you should avoid being exposed to substances that might cause infection to the pierced site. Keep your clothing clean at all times. If the piercing site is on the ears, then you have to be very mindful when it comes to using telephone and pillowcase. See to it that anything that gets in contact with the piercing site is clean.